It was the middle of the 60’s when an ever-growing demanding market called for a larger range of high performing coatings. Not satisfied with the performance alkyds, polyurethanes, acrylics, nitrocellulose and other polymer-based coatings were providing, chemical researches started to develop a new type of resin that could be used in solvent-borne and powder-based coatings. The efforts paid off and solid epoxy resins, characterised by middle to high molecular weights, were born. All the performance requirements were met: resistance to chemicals and corrosion as well as excellent adhesion and outstanding performance in home appliances. Further evolution of the technology saw a combination of epoxies and polyesters with new reactive hardeners, and since then, further ways of applying and curing powder coatings have been developed providing versatile and high performing coatings to many industries. Similar to other chemical production processes, epoxy-based powder coatings undergo a multi- staged manufacturing process before they are ready to be used. At first, hot, molten epoxy resin is charged from the reactor to a cooling steel belt where it solidifies. Then, a crushing and grinding device transforms it into tiny flakes which are then packed and supplied to manufacturers, who mix the solid resin in extruders at elevated temperature and pressure with hardeners, additives, pigments and fillers according to application specific formulations. After the extruded blend has cooled down, the mixture is milled and classified to the desired particle size using a special mill. Et voilà, ready to coat! Epoxy coatings are extremely resistant to corrosion and harsh chemicals, hence they are amazing metal protectors. For example, epoxy-based powder coatings are used to coat pipelines, poles and pillars, as well as to coat steel rebars used in high load-bearing concrete structures. Similarly, marine vessels and structural foundations buried into the ground enjoy the wide range of epoxies’ anti-corrosion benefits. 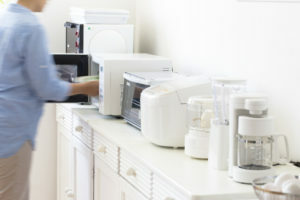 However, the most common applications of powder coatings are “white goods”: refrigerators, washing machines, stoves and microwaves, which come into frequent contact with water and cleaning detergents. Most white good coatings use a combination of epoxy and polyester resins, titanium dioxide and barium sulphate to ensure they stay white and well protected for a long, long time. Similarly, some toolboxes and industrial furniture, frequently exposed to aggressive cooling, lubrication and cleaning fluids typically have an “ivory” colour, indicating a high epoxy content which provides long-lasting protection. Powder coatings are usually applied using a powder spray gun. The powder, which is electrically charged in the gun as it passes through the spray head, is attracted by the opposite charge applied to the ‘earthed’ component being spray-coated, thus acting like a magnet which ensures that the powder is uniformly distributed on the metal part and perfectly adheres to the surface. The metal part is then introduced into an oven where the powder coating melts at 140 – 220 Cº, initiating the curing reaction of the powder’s reactive components. Once the epoxy resin has reacted with the hardener and cooled down, the finished coating will perfectly and seamlessly adhere to the surface. Another advantage of powder coatings, compared to other systems, is that the powder which was not consumed during the powder spray coating process, can be reused. Epoxy-based powder coatings are thriving thanks to the high demand for environmentally friendly paints. These coatings do not produce any hazardous vapours, neither for factory workers nor for users of the final articles. On top of this, the long-term protection they provide extends the life expectancy of infrastructures and articles alike, thus reducing maintenance and replacement costs. And the industry is taking even further steps to create even more sustainable epoxy resins using bio-based components, which can help producers meet increasing consumer and regulatory demands for sustainability.